Kentuckians love music festivals and music-centered events – they’re among the most popular activities in the entire state. Beautiful Carter Caves State Resort Park has a musical tradition that’s coming up in September. Read on for the details! 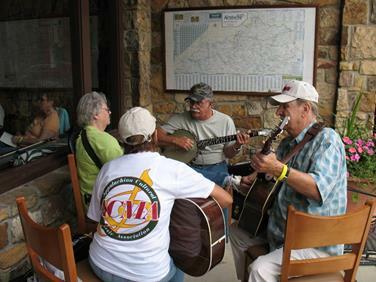 Carter Caves State Resort Park will host the 47th annual Fraley Mountain Music Gatherin’ Sept. 7-10. The festival that began as a family reunion honors old-time music and eastern Kentucky traditions as well as the late master fiddler J.P. Fraley. Musicians will be jamming in parking lots and sharing music around the campfires of Carter Caves State Resort Park. Musical instruments such as the dulcimer, fiddle and guitar are used to tell stories about life long ago in the eastern Kentucky foothills. On Wednesday, Sept. 7, there will be a free “Jamming in the Round” get-together in the campground starting at 8 p.m. On Thursday, Sept. 8, starting at 7 p.m., enjoy an open stage concert in the park’s amphitheater. At 1 p.m. on Friday, Sept. 9, the amphitheater will come to life with an open stage, a banjo gathering and a dulcimer gathering. Friday’s activities will be capped with a 7 p.m. concert in the amphitheater. Saturday morning, Sept. 10, there will be a kid’s jam session in front of the lodge. Late morning into the afternoon the amphitheater will resound with sessions devoted to ballads, storytelling, and Carter Family songs, and conclude with a fiddle gathering and guitar gathering. Saturday night’s concert in the amphitheater begins at 7 p.m. Paid admission is required for concerts and jam sessions Friday afternoon through Saturday night. Fees range from $4 to $10. A festival pass for all programs costs $25 per person. The Friends of Carter Caves will provide refreshments during the event. For more information, including a list of invited musicians, contact Paul Tierney at paul.tierney@ky.gov or festival organizer Barb Kuhns at bkuhnsfiddle@yahoo.com. Visit the festival website atwww.fraleyfestival.com.